Protect yourself, your family, your pets and your home. Replace your battery at least once per year. Americans say they change the battery immediately when the detector alerts to low battery. An increasing number of states and municipalities require 10 year lithium batteries - check with your local authorities. Never use rechargeable or heavy duty batteries in your smoke detector. RAYOVAC® is committed to helping you keep your family safe! Take a moment to read this page and learn the batteries to use in your smoke detectors. 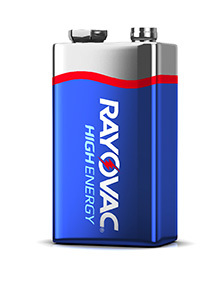 What kind of RAYOVAC® battery should I be using in my smoke detector? 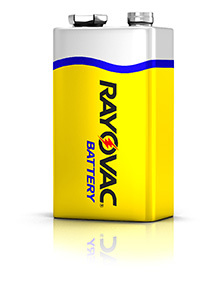 This battery is the most powerful RAYOVAC® battery, so it will give you a long service life in your smoke detector. If you have a free-standing smoke detector, either ionization or photoelectric, you should use this battery, as these detectors depend solely on you replacing the battery to work properly. This battery will last up to 10 years in ionization smoke detectors and up to 7 years in photoelectric smoke detectors (both free-standing versions). People with hardwired smoke detectors should consider this battery to save time in replacing smoke alarm batteries. Many people use this battery for those hard-to-reach smoke detectors. We recommend you continue to test your smoke detector twice a year at minimum, to prevent the rare case of smoke detector or early battery failure. A great reminder is to test the smoke detector every time you change your clock for Daylight Savings Time. 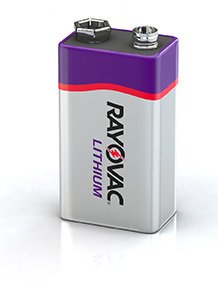 This battery will last up to 5 years in an ionization smoke detector and up to 3 years in a photo electric alarm (both free standing versions). We recommend you continue to test your smoke detector at a minimum of twice a year in the rare case of either a smoke detector or early battery failure. A great reminder is to test them every time you change your clock for daylight savings. This is the standard battery that comes with many inexpensive smoke detectors. This is the least expensive option, and it also has the shortest service life, only lasting up to 2 years in an ionization smoke detector and only up to 1 year in a photoelectric smoke detector (both free-standing versions). This battery is ideal for families or businesses who change their smoke detector batteries once or twice a year. We recommend you test your smoke detector monthly to prevent rare cases of smoke detector or early battery failure. Remember, never use a rechargeable battery in a smoke detector, as brands vary greatly in how quickly they lose their charge (some lose it in just one month) and are not designed for usage in smoke detectors. Also, remember when purchasing brands other than RAYOVAC® that performance may be lower than stated about the RAYOVAC® products above.